NASA Administrator Charles Bolden speaks at a panel discussion on the search for life beyond Earth at NASA headquarters in 2014. It was Nov. 23, 1963, the night after President John F. Kennedy&apos;s assassination. Charles Bolden was a high school senior, playing in the South Carolina state football championship game. He was mourning Kennedy&apos;s death along with the rest of the country, but he was mourning something else as well. "I saw my chances of going to the Naval Academy kind of evaporating," he said in an interview with NPR&apos;s Morning Edition, more than 50 years later. But Bolden did make it to the Naval Academy. He went on to serve in the Marine Corps as an aviator, flying more than 100 combat missions in North and South Vietnam, Laos and Cambodia in the early 1970s. Bolden later became a NASA astronaut and traveled to orbit four times aboard the space shuttle. After his last space flight, he returned to the Marine Corps and achieved the rank of major general. Then in 2009, he was appointed the administrator of NASA, the first African-American to hold the office. But that first critical step of attending the Naval Academy almost didn&apos;t happen, Bolden says, when his state representatives would not nominate him for consideration because he was black. One of South Carolina&apos;s senators at the time, Strom Thurmond, flatly rejected Bolden&apos;s request. "[He] told me, &apos;No way are you going to get an appointment from me to go to the Naval Academy,&apos;" Bolden says. "It was clear why they were not supporting me and it was because of the times. They were just not about to appoint a black to the Naval Academy or to any Academy." But Bolden had a backup plan. 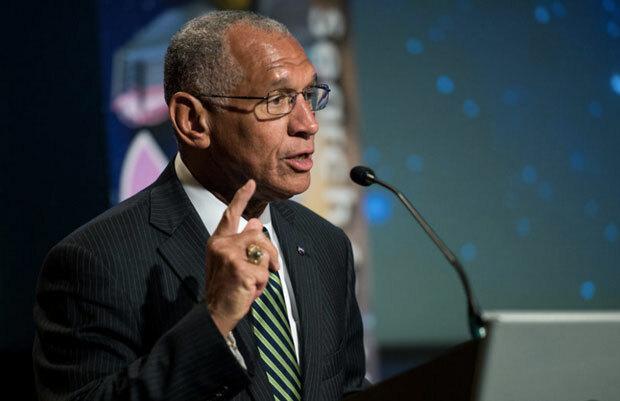 He had been in correspondence with Vice President Lyndon B. Johnson during his junior year of high school, and Bolden was banking on this connection resulting in a vice presidential appointment to the academy. Bolden explains that everyone is eligible for a nomination from the vice president, but that only the children of armed forces personnel are eligible for a presidential nomination. "It was indeed an honor for me to hear from you last Spring, while you were serving as Vice President, in regards to my request for consideration for appointment to the entering class of &apos;64 of the U.S. Naval Academy. "Then you requested that I write to you after July 1, when you would know if you had any vacancies at the Academy. "I am still very interested in becoming a Midshipman and possibly making the Navy a career. Would you, therefore, refer me to someone who will be able to consider my application, since I am not eligible for a Presidential appointment. "I would appreciate very much your help in this matter." "I pleaded for help," Bolden said. "A recruiter came to my house in a few weeks and said &apos;Hey, I understand you want to go to the Naval Academy.&apos;"
Then, he says, Johnson sent out a retired federal judge all over the country looking for qualified young men of color to go to the service academies. The judge came to Bolden&apos;s school and, in the end, he was able to secure an appointment from Rep. William Dawson of Chicago. Bolden hasn&apos;t forgotten the discrimination he faced as a young man, but from his current vantage point, built by years of hard-earned success, he takes a reflective look at those who wronged him. "My mother went to her grave believing that Strom Thurmond probably helped. Because every milestone in my life after I got to the Naval Academy, as long as he lived, I got a handwritten note from him, you know, saying congratulations," Bolden says, his voice cracking with emotion. He says he took this to mean that people are capable of changing. "Even people who seem to be evil or seem to be bad, deep down inside they know what&apos;s right and they want to do it and they will try to find a way to make good things happen," Bolden said. "I am the eternal optimist and I am an idealist."